You might have several years of blogging experience but the only obstacle that never lets us perfect the art of SEO is its ever-evolving nature. Sticking true to Darwin’s Theory of Evolution, SEO evolutions and uninterrupted introduction of new algorithms may easily frustrate an SEO practitioner. But the fact is that all the changes are done in favor of not only readers and audiences but for SEO specialists as well. Now, there are fewer elements that define SEO strategy. Also, you don’t need to pour sums of money to bring your website on first pages. All you need is technique and true understanding of modern SEO strategy attributes defined here. There are three key elements to focus on for devising your modern SEO strategies. These include analytical approach, content that makes search engines happy and digital socializing. Although, we need to optimize our websites on all search engines but our primary focus should be on Google as it is the most used search engine worldwide. But there are still some substantial elements which can be used to measure the success of your SEO strategy. Here are the elements. Instead of 350 to 500 word articles, search engines specifically Google prefers 1000 to 3000 word articles. Google analyzes the quality of information in your articles with the factor of relativity. It is defined as how much the article body relates with the topic. Search engines check relativity with the use of words. For example, black is a color and Black is a clothing brand. If you use related keywords like color, color psychology and color meaning in your article, Google will optimize it for ‘color niche’. If you use related keywords like clothing, dress code, elegant dresses and party wear, Google will optimize it for ‘clothing and brand niche’. Storytelling, references, hype creation and scene-setting are some techniques to make your content more interesting. Remember that fancy language only make the content less-interesting, confusing and deviating from theme. From marketing to driving more people to your website, social media has become the global eye candy. In general terms, digital or internet socializing refers to communicating with your friends and families through internet. Celebrities and businesses use to it connect with fans and customers. Internet socializing for SEO is a mixture of personal and business oriented social networking. In this type, we convert visitors into customers and followers by adding value to your communication strategy on social media. In return, they read your content and share it on the social media i.e. improving readability and sharing. But why is this important? Why Do Social Networks Matter? A few years ago, people used to make business accounts to promote their websites on social media by posting links. It was a type of random communication i.e. random people commenting on your post. The modern type is of personalized communication on social networking sites. Previously, Google used to track the number of comments and shares on your website. Now Google tracks the number of times your brand name or website is individually typed in its search bar or on social networking sites. Popularity, branding and advertising decide the page rank of your website or blog. Here is a quick look on step-by-step process of establishing a brand oriented social network. 1. Create a group, page or community. 2. Make it a brand by giving it a unique theme. 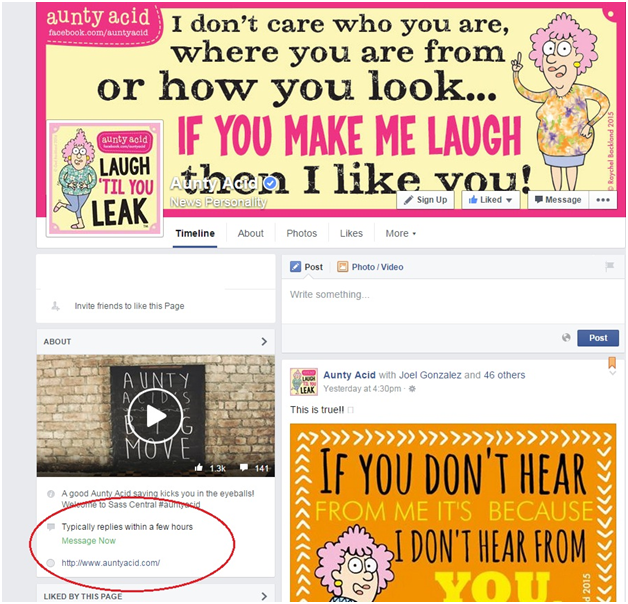 For example, Aunty Acid is a popular brand on Facebook which also runs different websites and shares content. But the specialty of this page is immediate and individualized responsiveness to every comment. 3. Make your brand popular by advertising it. You can also use email marketing techniques but an easier way is to pay a few dollars to social networking sites similarly the way you used to pay for backlinks. Social networks are the new backlinks. 4. Create interesting content on your website and share it with your social networks. People clicking on the links will be driven to your website. Don’t forget to promote to add call-to-share. 5. Tag random people from your page in posts. It adds value. 6. Individually reply to all the commentators. 7. Stay in touch with them. Establishing social networks and creating interesting content are beneficial only if you successfully end up with 100% ROI or more. For analytically generating Return on Investment, here are some techniques. Offer newsletters and subscription discounts to make your website/blog/brand appealing for them. You can also offer complimentary objects for improving communication from digital to physical world for example; Aunty Acid sells calendars and mugs. Track your best-time visitors and post more content during happy hours. Instead of generating B2C environment, focus more on establishing C2C environment while earning the benefits of B2C from them i.e. communicate with individuals and make communication casual. Keep telling stories of your brand. Track the priorities of your customers. Write what they and how they want. Keep using search engine’s keyword tools to create composite keywords. Don’t forget to add all social network sharing buttons on your web pages. Above all, track your Google page ranking. Don’t miss a single network to connect with your leads. Use all media i.e. text, photos and videos to create content. How a Good Customer Experience Strategy Can boost your Website Revenue? Is Your Business Struggling to Achieve Optimized Digital Marketing? LinkedIn Paid Ads : How to Get Started? Various Types of Google Penalties and Know How to Recover It? Why is Mobile SEO Important For Your Business? How Can One Take Advantage of Guest Blogging? Google Disavow Tool Hidden Facts: When and How You Should Use It? Powerful tips to Make Your Website More Click-Worthy!! Mobile Social Campaigns- Is Your Social Media Campaign Mobile Friendly? Google Authorship is Dead – What About Google Plus and Author Rank? How Influencer Marketing Impacts Your Business Branding in a Positive Way? Jyoti Mali is the Head of Digital Marketing at TIS India, a Digital Marketing agency in India focused on SEO, digital analytics, online advertising, CRO, web design & development. She leads strategy for multi-channel digital advertising for in-house accounts & agencies globally. Being a Google Analytics Certified (IQ) Professional & Ecommerce Analytics Qualified Consultant, she loves playing with Analytics & helping clients with actionable insights.